Some of you may remember that one of the dishes that caused me to fall in love with La Cava del Tequila in Epcot’s Mexico Pavilion was their “dessert” – manchego cheese with guava paste and agave syrup with poppyseeds. 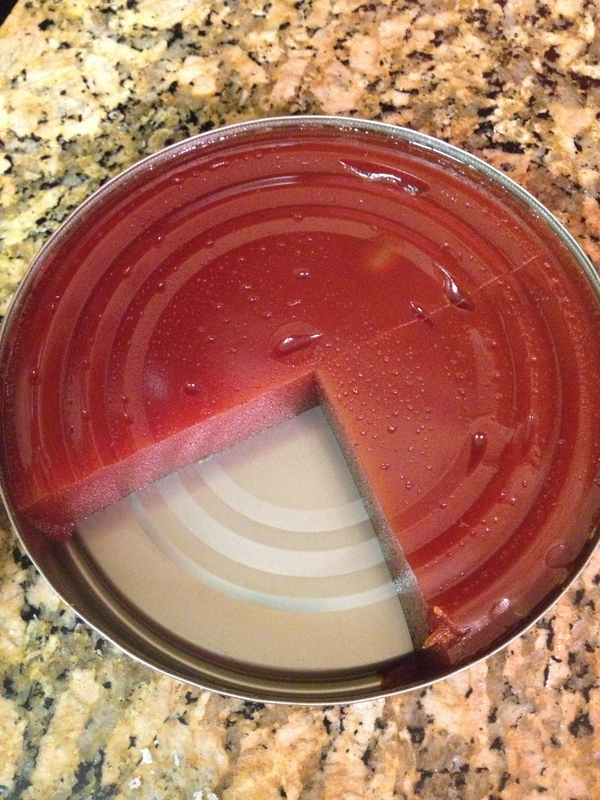 First, open up a can of guava paste. I found it in my local Indian grocery, made by Goya. 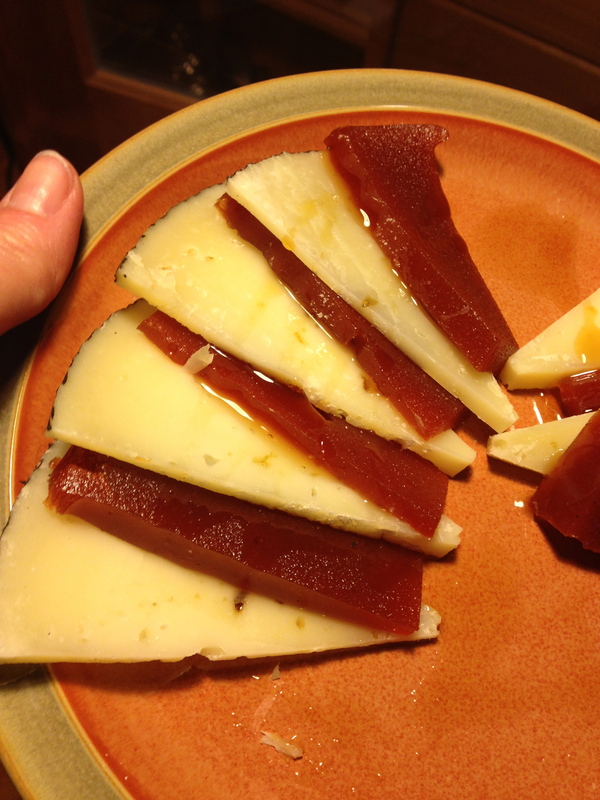 Next, slice the manchego cheese and guava, and alternate slices on a plate. 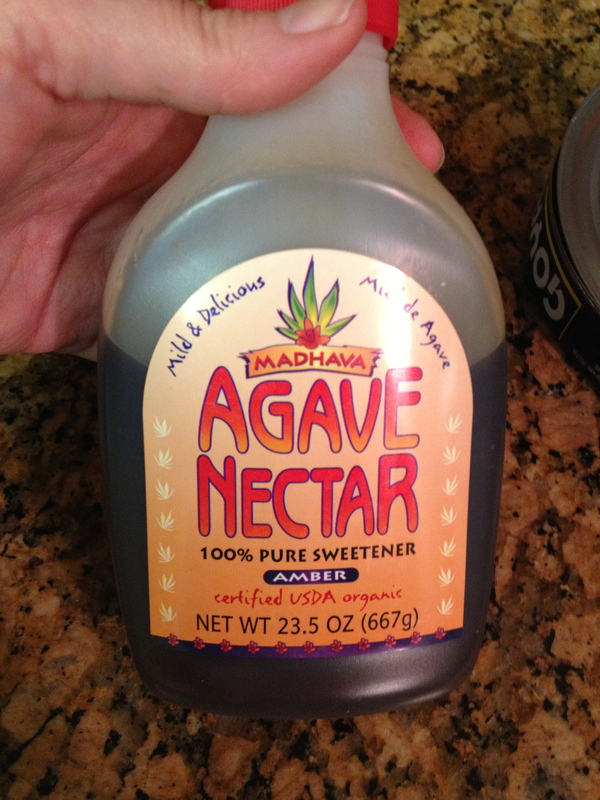 Drizzle with Agave nectar. Et voila! Snackage, perfect with wine. Cava del Tequila used to serve it with Carr’s Table Water Crackers. Maybe with such good snacks I can entice my husband to watch The Bachelor with me. Ya think? Three sad Mice…three sad Mice… I suppose everything changes, but this was one unpleasant surprise for our little family. 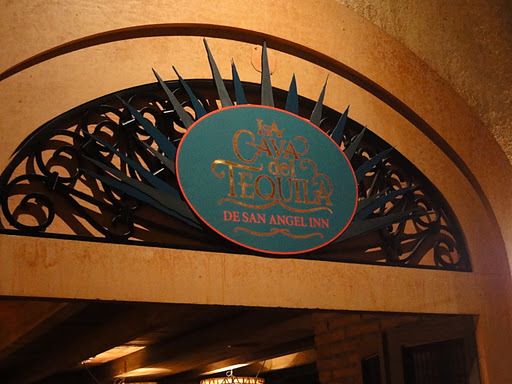 We’ve come to really look forward to visiting La Cava del Tequila in EPCOT’s Mexican pavillion, not just for the amazing tequila selection, but for the excellent tapas. In fact, La Cava was the inspiration for this blog and rating system. The first time we visited, I looked at Mr. MouseChow and said, “Wow, I wish this place were in our neighborhood. We’d be here every week.” Thus, my previous 4 Mouse review. I should have known something was up when on our third visit the vegetarian chicharones had been replaced with regular tortilla chips. The slide toward mediocrity had begun. But let me back up a little and tell you the sad tale of our September visit. It was the final day of our long weekend in Disney, and we’d planned to spend the day snacking our way around World Showcase, playing the Kim Possible game. Our first stop? La Cava del Tequila of course! We were there 15 minutes prior to opening, cooling off in the darkness of Plaza de San Angel and anticipating yummy Mexican snacks. 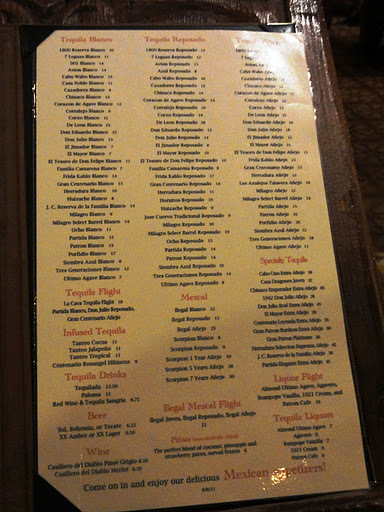 While the family shopped around the empty plaza, I spent some quality time with the tequila menu. Wait! Where are the taquitos? The vegetarian chicharrones? 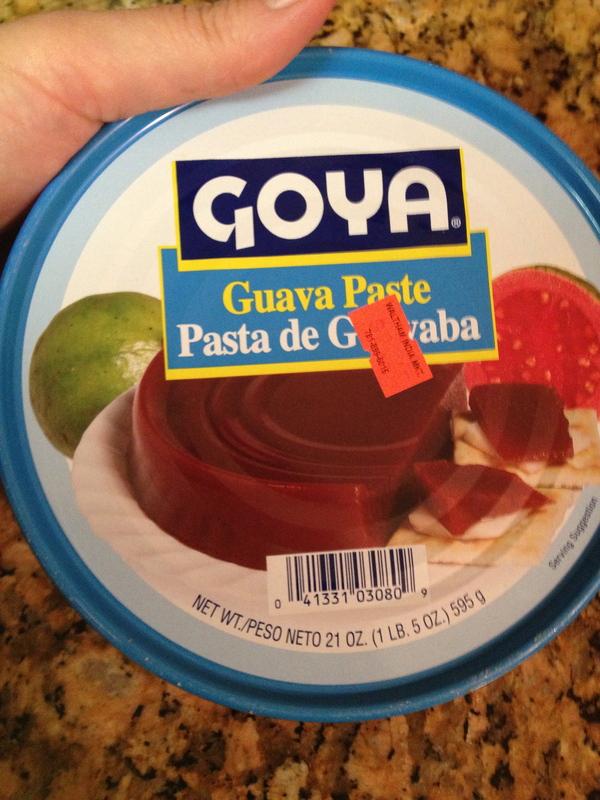 The MANCHEGO AND GUAVA??? They are gone, gone, gone. Now you can get chips with either queso, guac, or salsa, or go crazy and get chips with queso, guac, AND salsa. The crab tostadas are still there, and now there is shrimp cocktail. With salsa. And chips. Can you tell how sad we were? The drinks were pretty much the same, but they were never great. The draw was the creative and tasty app menu. We didn’t see them making the guac, and it wasn’t served in the molcajete, but it was OK. The queso was nothing special. Melted cheese with some jalepenos. The salsa was actually the highlight of the plate. It had a nice dark chipotle en adobo smokiness. The Margarita menu was the same as far as I can tell. The pineapple and jalepeno margaritas were fine, but smaller than they look. The best drink we had was the non-alcoholic Pinata. 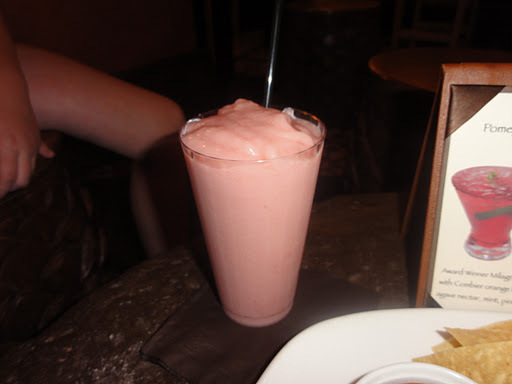 It’s a frozen combination of strawberry and coconut, and it’s very yummy. I can only imagine that it was not profitable to stock the fairly diverse number of ingredients that comprised their former menu. So now they have to buy onions, avocado, cilantro, lime, prepackaged queso and salsa, shrimp, canned crab, and tortilla chips. Update as of 12/10/2011: Menu still the same. Common sense is not my strong point, which is the only way I can explain how my family and I ended up vacationing in Walt Disney World during the first week of August, 2010. As we slogged through Epcot in the Florida midday heat and humidity, clutching the triggers of our personal spray-fans for dear life, we were ready to do just about anything to cool down. Including possibly eating lunch at one of my least favorite places in Epcot, San Angel Inn in the Mexican pavillion. So with thoughts of cooling off in the lovely air-conditioned faux twilight, we ducked into the Mexican pavillion to have a look around. Once our eyes adjusted to the dim lighting and we were able to breathe again, we came to our senses and decided that we could make it a few more feet to eat at one of the other World Showcase options. 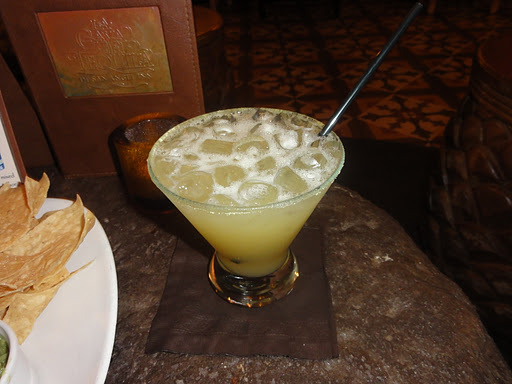 Then, we spied La Cava del Tequila, tucked away in a corner near the fountain, and practically empty. 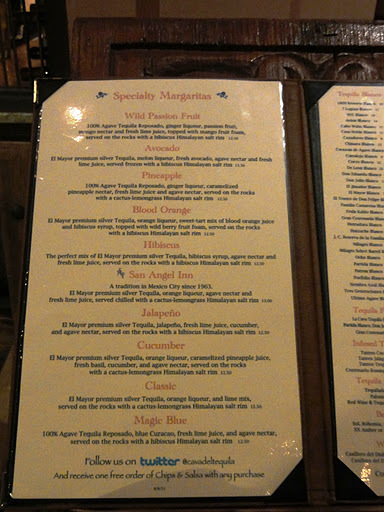 A quick glance at the menu made the Cava’s priorities clear – several pages of tequila varieties and Margaritas, followed by one cursory page of appetizers. But given that the place was empty at lunch time during the busy season, and that we didn’t have lunch reservations anywhere else, we decided to stay a while. We were so glad we did. The guacamole is truly excellent. I took this picture on my third visit to La Cava. The first two times it was served with vegetarian chicharrons (which are much, much better than they sound), but the last time I went was served with chips. Hopefully this was just a temporary sourcing issue and not a permanent change – the chicharrons were still listed on the menu. If you go, please let us know what comes out of the kitchen! We also had crispy flautas (beef taquitos topped with cojita cheese), and lovely delicate little crab tostadas with lime and cilantro. We liked the tostadas so much we ordered a second round. 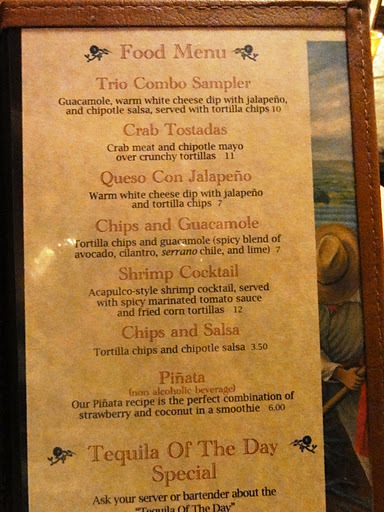 Oh, and did I mention that La Cava del Tequila serves…tequila? Over 70 types according to their website, plus some creative Margaritas, Mexican beer, mezcal, and “Pinatas” – a non-alcoholic tropical fruit smoothie. 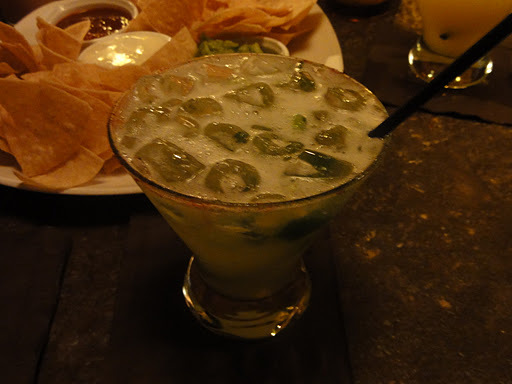 They will tell you that the avocado Margarita (below) is the way to go. Don’t believe them. I am a big fan of avocado boba, but this was just too sweet. The better options are the Classic or the Jalapeno. Given my love of all things spicy, I went with the Jalapeno. It had a little heat, but mostly was just refreshing and delicious. There is one dessert on the menu at La Cava, and if you don’t look closely you could miss it. It is simply slices of guava paste and manchego cheese, topped with agave syrup, berries, and poppy seeds. We have become a little obsessed with the combination, and have recreated this at home a few times since our trip. Mmmmmmmanchego! Happily sated with fried food, guacamole, cheese, and tequila, we were once again ready to face the crowds and heat of Epcot in August. La Cava del Tequila is a gem. A little off the radar for the majority of park goers, they don’t take reservations and you won’t find characters (or many kids) in the bar. It’s a welcome respite. And you can still bring your kid.